Silicon Dioxide, Natural and Artificial Flavors, Citric Acid, Malic Acid, Acesulfame-Potassium, Sucralose, FD&C Red No. 4. Shake container thoroughly before use. Consume 30 to 45 minutes before activity. We strongly recommend that you assess your tolerance first by using 1 scoop mixed with 6 oz. of water, especially if you are sensitive to stimulants. For full effects, mix 2 scoops with 12 oz. of water once your tolerance has been assessed. Do not exceed 2 scoops in a 24-hour period. Maintain an adequate state of hydration during use. Read the entire label before use and follow directions provided. Not intended for use by persons under 18. Do not use if pregnant or nursing. One serving of this product contains up to as much caffeine as 2 cups of coffee. Caffeine-sensitive individuals may experience symptoms including (but not limited to) restlessness, nervousness, tremors, anxiety, increased heart rate or difficulty sleeping. Do not combine with other sources of caffeine or stimulants. Consult a medical doctor before use if you have a medical condition and before starting a diet or exercise program. Some individuals may experience a harmless tingling sensation from the concentrated performance dose of beta-alanine. KEEP OUT OF REACH OF CHILDREN. Silicon Dioxide, Natural and Artificial Flavors, Citric Acid, Malic Acid, Acesulfame-Potassium, Sucralose, FD&C Red No. 40. Silicon Dioxide, Natural and Artificial Flavors, Citric Acid, Chicory Root Fiber, Malic Acid, Sucralose, Acesulfame-Potassium, FD&C Red No. 40. Natural and Artificial Flavors, Sucralose, Malic Acid, Acesulfame-Potassium, FD&C Red NO. 40. Contains sulfites. Processed in a facility that processes soy, milk, egg, fish, shellfish, tree nut, wheat, and peanut ingredients. Shake container thoroughly before use. Consume 30-45 minutes before activity. We strongly recommend assessing your tolerance by using 1 scoop mixed in 4 oz. of water, especially if you're sensitive to stimulants. Increase to 2 scoops mixed in 8 oz. of water. 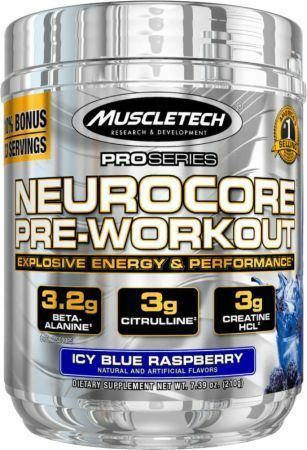 For full effects, increase to 3 scoops mixed in 12 oz. of water. Do not exceed 3 scoops in a 24-hour period. Drink 8-10 glasses of water daily for general good health. Read the entire label before use. Other Ingredients:Natural And Artificial Flavors, Sucralose, Malic Acid, Acesulfame-Potassium, FD&C Red NO. 40, FD&C Blue No. 1. Processed in a facility that also processes milk, egg, wheat, soy, tree nut, shellfish, and fish ingredients. New potent formula - Amazing taste! Cherry Limeade This is a Buy 1 Get 1 FREE offer! Icy Blue Raspberry This is a Buy 1 Get 1 FREE offer!